– As soon as the doors opened at the venue, we knew we were going to have a full house. The TO had to go fetch more chairs from storage, but everything was in place by the time we started. The large turnout slowed down the day in several ways, but the TO was still satisfied with the overall pace of the event at the end of the day. 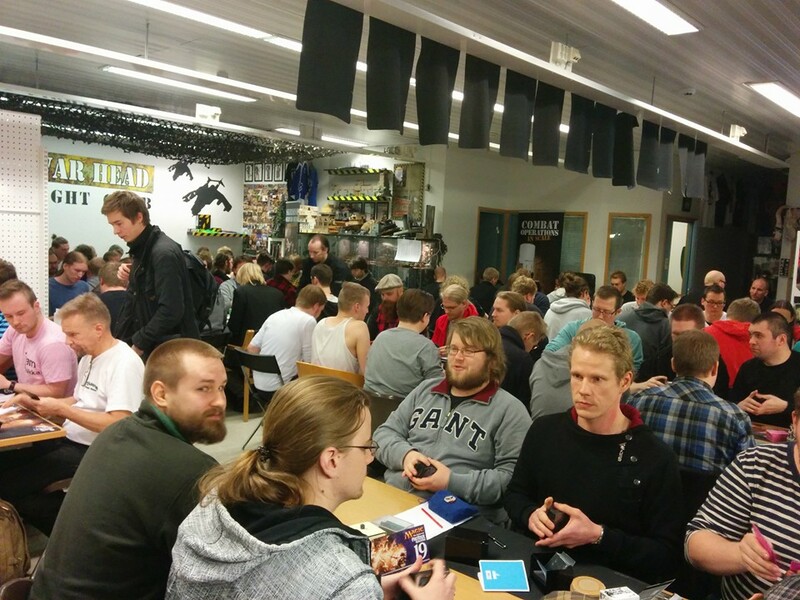 – I made a poor logistical choice in posting pairings in two locations next to the tables, which slowed down the process of getting players seated at the beginning of each round. A good solution to this would have been to post pairings outside of the play area. The play area had two exits to the rest of the store, so designating one as “in” and one as “out” would make the player traffic flow in a single direction and streamline the process. I probably could have saved close to half an hour of time this way, but I’ll have to try it for my next event there and see. – The round clock we had available didn’t start counting up when time in the round elapsed. I should have been more vigilant on keeping track of round ending times so that time extensions could be more fairly adjudicated. Even just writing the round ending time in my notebook could have helped here. – There were a few scorekeeping errors, and one round had to be fully repaired because of this. Accuracy in entering match results trumps doing it quickly every time, and an event of this size isn’t quite large enough that the scorekeeper had to worry too much about speed as long as the results start being entered about halfway through the round. That said, these sorts of issues do happen from time to time, but don’t beat yourself or another judge up over a mistake that can be fixed. There were no appeals and no mishandled calls to my knowledge. Here are the two most interesting rules calls I dealt with. Please discuss these scenarios in the thread, and I’ll provide how I ruled in a few days. 1. A mono-red Burn deck is playing against Green/Blue Infect deck. The mono-red player controls a Sulfuric Vortex. The Infect player asks you away from the table if they can still pay the alternate cost to cast Invigorate. Can they? 2. The active player casts a Shardless Agent and and announces the cascade trigger. The opponent controls Counterbalance and Sensei’s Divining Top. The active player asks “resolve the cascade trigger?” The opponent agrees. The active player cascades into Ponder. The opponent activates Top and then reveals an appropriate card to counter the Ponder with Counterbalance. The opponent activates Top again, then says “resolve Counterbalance for Shardless Agent”. Is this correct? What happens here? In the spring of this year, I moved from Canada to Finland, and to say that the cultures are different is more than a bit of an understatement. I’ve done what I can to integrate myself into the Magic community here, but I’m still very much an outsider. In the time I’ve been here, I’d judge three Competitive REL events before this one, two events of about this size as a floor judge and a 31-player PPTQ as head judge, but this event was my first time head judging an event of this size since my move. I felt confident enough going in, knowing the event would run smoothly enough, but I was concerned that there would be some sort of cultural differences or assumptions that I would run afoul of. Unsurprisingly, that’s exactly what happened here. Due to the number of players and the layout of the event, I wasn’t able to make my announcements clearly heard. Before I began my opening announcements, I asked the players (as I normally do) if they could hear me all right, and when none of them indicated otherwise, I proceeded with my announcements. Many of the players in the back corners of the room couldn’t hear me, but didn’t speak up. I’m used to dealing with groups of players where there’s always someone willing to speak up in a case like this, but in Finland I’m told there’s something of a social taboo against singling yourself out in a crowd. When I’m in a leadership role like I was at this event, I like to engage with my judges and try to get to know them better, chatting with them over the course of the day about their judging careers and their goals for personal development and growth in the judge program. I tried to do that at this event and ran into something of a wall for a couple of reasons. Firstly, Finns simply don’t DO small talk. In general, you don’t chit chat with someone unless you have something important to say. This carries over into the second part, which is that Finns consequently don’t seem to like to or want to talk about themselves, probably because they’re simply not used to doing so. (See the bit about no small talk.) I was able to eventually open my judges up to this kind of discussion, but it wasn’t as natural and relaxed as I had hoped it would be. Teemu , one of my floor judges, brought these issues to my attention during our debrief at the end of the day and I’m very grateful to him for doing so. It takes a lot of courage for a Level 1 judge to tell a Level 3 judge that they’re doing something “wrong”. Even L3s are human and make mistakes. We can’t improve without feedback from our peers at every level. What both of these issues boil down to is the fact that I was used to how the Canadian and American Magic communities acted and reacted, and while I was aware of the differences I mentioned on a broad cultural level, I hadn’t internalized how that would actually affect my usual behaviors and methods as a judge. I had internally expected these players and judges to behave like the ones I’d grown up with as a player and judge. I’ve seen and experienced a lot in my years as a judge and a player, but not all of the experiences I’ve had in that time and not all of the expectations I’ve developed are going to be correct in every situation. The judge program is global, but our experiences are still only local and at best regional. So how would I fix these two specific problems for next time? I’m not sure exactly. I plan on talking with other Finnish judges to find out what works for them. If I had to deal with them in the moment, then I would ask the local judges on my team what works for them and try one of their solutions. No group can be reduced to simply its stereotypes, but the difference between people in different continents, countries, even regions of a country can create real differences in how a situation needs to be approached. What works well in one place can yield more neutral or even negative results somewhere else. Whenever you judge somewhere new, try be aware of how the community there is acting and reacting to what you’re saying or doing. If something feels like it’s not working the way you want it to, talk with someone local and see if you can figure out why that’s the case, and what you can do differently to get the results you want. I certainly will do my best to be more aware of these issues as I judge more events in Finland and elsewhere in the Magic world. Editor’s note: Please leave your feedback and comments on the JudgeApps forums too! 1. Sulfuric Vortex is interestingly worded as a replacement effect instead of a prohibition on gaining life, so I think you can still pay the alternate cost. It gets replaced with the opponent gaining no life instead, but the cost was still paid. If it said “Players can’t gain life”, then you couldn’t. 2. The cascade trigger goes on the stack first, followed by the Counterbalance trigger, so the opponent allowing the cascade trigger to resolve means that the Counterbalance trigger for Shardless Agent was resolved. Since the Counterbalance trigger is a may, they’re allowed to resolve it without doing anything. So, since the opponent has properly activated Top, resolved the Counterbalance trigger for Ponder, and then activated Top again, I think they’re just stuck with where they’re at. There isn’t a Counterbalance trigger to resolve, so the players play on from the current state. 1) Yes, they can. You ‘pay the cost’ and as a replacement no life is gained, so it’s just free. 1. Can’t trumps can, and my first instinct was that the alternate cost couldn’t be paid, because Sulfuric Vortex prevents lifegain. But I’m not positive on this–SV reads a bit to me like a replacement effect rather than an explicit ‘cannot gain life’, so the alternate cost could be paid perhaps? However, I feel slightly more confident in the following: the lifegain is the cost to cast the spell if casting it via the alternate cost… and since SV says no life is gained, then the cost is not paid, and the spell cannot be cast. Yeah, I could be wrong. 2. Shardless Agent is cast, and so goes on the stack, followed by the cascade trigger. Shardless Agent could be countered now, but the cascade trigger needs to be Stifled or similar, as it’s now independent of the Agent. The cascade trigger is resolved first, putting Ponder onto the stack. Activating SDT to counter Ponder, and then doing so again to counter Shardless Agent seems like a perfectly legal action to me, and as such Ponder and Shardless Agent wouldn’t resolve. The only situation I can think of that would change this is whether the opponent had priority to do so–without priority to activate SDT, they wouldn’t be able to rearrange the library in order to reveal the appropriate card.